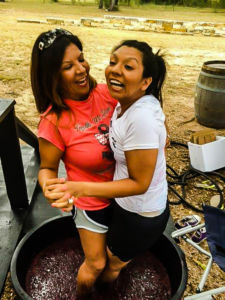 Mother and daughter stomping grapes — a picture of laughter and fun that both would describe as a miracle. In July 2015, Korinna had a cardiac arrest and collapsed on her bedroom floor. By the time her mother found her, the 20-year-old had gone without oxygen for an extended time. Paramedics had difficulty reviving her. Doctors didn’t offer much hope that should would recover. Megan says, Korinna made it clear she did not want to live in a nursing facility. She was a typical 21-year old girl: she liked getting her nails done, gossiping with her sister, and shopping with friends. She was extremely close to her younger sister and her mother and longed for the family life she had before. They started planning her return home. Megan helped the family get access to the Home and Community-Based Services program as well as other Medicaid benefits that allowed Korinna to move home. Korinna receives nursing and therapies and continues to get stronger. She has people that help her with personal care if her family and friends aren’t available. Her health has improved and she has made a lot of progress, but according to her mother, being at home with family is what has made the difference.